Researchers report photoimmunotherapy to be effective against elusive gastric cancer cells following transduction with the gene that expresses the extracellular domain protein of HER2. The results are published in the journal Small Molecule Therapeutics in February 2016. 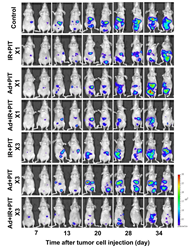 The time course of the bioluminescence images of tumor bearing mice after treatment in vivo. The novel therapy of molecular-targeted photoimmunotherapy integrated with gene transfer technology is a promising approach for the treatment of peritoneal dissemination in gastric cancer.